A friend just told me that she did not know if I had noticed how different I am from the way I was last year at this time. My Lord has blessed me with the ability to completely forget the bad or at least not remember bad things that have happened in my life in any kind of sequential order—quite a feat considering I am a sequential kind of gal. Thankfully, I have this blog to keep a record not just of events but of my spiritual state of being as well. I have not forgotten the burden I felt for my former church that became so keen and overpowered every thought and prayer I had at the time. I nearly lost myself in the quagmire between wrestling with what God wanted and what the church wanted, and what I might have wanted, other than trying to please my Lord rather than fight with Him, was completely pushed aside. I believe there were many reasons I had to go through that short season of my life, but one in particular now is far more evident than before. A few weeks ago I did something I have been wanting to do for a long time since even before we began visiting other churches in January, even though I still was wrestling with God to just do it. A visiting pastor invited anyone who needed healing to come up and let him pray for them. I wanted to be healed of a few minor physical things, but there I was standing next to a man, who of all the people there, had the greatest need for healing; a man on oxygen and barely able to stand. Immediately, I felt selfish for coming up as I knew this man needed healing far more than I did. I also felt terribly sad because I just knew God had another plan and he would not be receiving it at that time as much as he wanted it. (I did not know him or the situation, but I just knew his time was short—the very next Sunday, we were celebrating his passing on to be with his Lord.) So, I am standing there wanting to go back to my seat thinking of how my needs are so little in comparison to him and probably everyone else there...as if no one should waste a prayer on me. The pastor did not just pray for me but passed on words of knowledge from the Holy Spirit. He talked to me about how I did not love myself. It is still very difficult for me to accept this. I always feel that I am rather selfish and even demanding, but this pastor was sharing what my Lord wished for me to hear so I tried to listen and accept them. He also said that being humble is not what I was doing, although I might believed it to be that. If I am to love my neighbor as I do myself, yet I do not love myself, then my neighbor is in trouble. That hit me very hard. I have never thought of it that way. Although I did not know it at the time, that was a pivotal point for me and I have yet to grasp it completely. For the last few months, I think I have been in a very slow recovery of a lifetime of denying myself that I had come to begin to recognize almost a year ago yet it got kicked up a few notches that day. Even as I write that I still hear the denial of it in my mind as I try to convince myself I really have not been doing this. I survived poverty and abuse in my childhood, but continued in a self-imposed semi-state of self-denial and self-degradation. I write a semi-state, because I have fought against going too far and slipping back into a clinical depression. I have lived through such a depression once in my life for nearly two years and I just refuse to allow myself to be in that debilitating hell on earth ever again. However, the few times I began to make peace with identifying my self-worth, something would happen that would make me pull myself back down to that point of not being depressed yet not really enjoying my life either...as if whatever changed was a sign from God to make sure I did not become too full of myself, so I led myself to believe. Now I am thinking that I was attributing something to my Lord that was not from or of Him. If you have read my blog for some time, you may have recognized this struggle in my writings...at least, I am seeing it for myself now. So, recently, I have noticed that I have been doing some little things that I just like to do for myself...and others too. I have been more generous, not because I feel I should be, but because I really want to be, which has been growing in me as well. It is not just giving to others, but also allowing myself to enjoy things as well—I really did not realize how much I do not allow myself to enjoy things, all kinds of things...I probably still do not fully realize it. This glass bead bracelet has become my personal symbol of love. 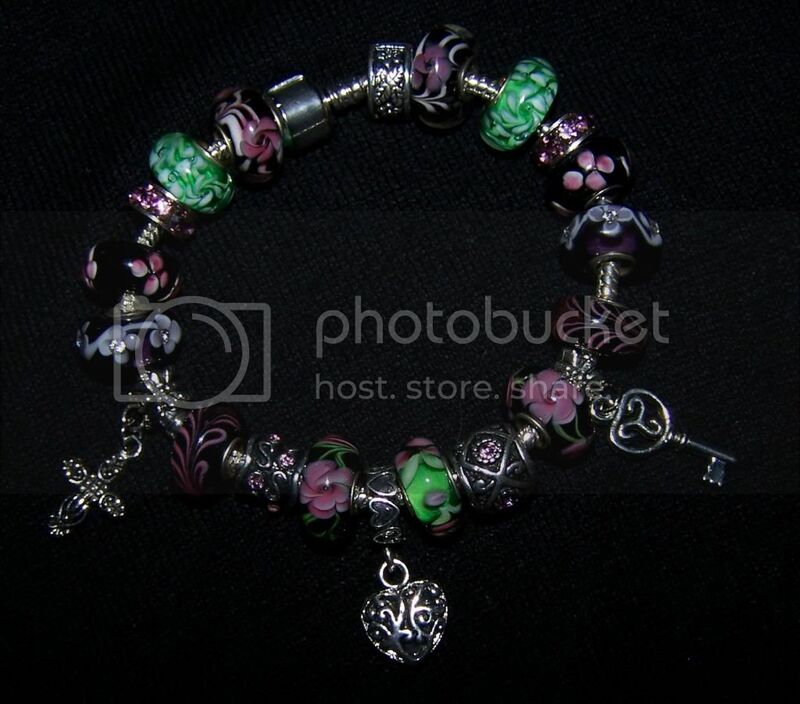 I saw bracelets like this a few weeks ago on display at the studio of the Princess' piano teacher. One of her "piano moms," as she calls the mothers of her students, makes these Pandora style bracelets to sell for $20, who can pass up a price like that with beads that look like this! I decided they would make nice gifts for a couple of friends and also for me, as it was around the time of my birthday. I met the jewelry maker at her home a few weeks ago and pick out bracelets for the others and had decided that even though I am not much of a jewelry kind of girl that I really liked these and I was determined to get one for myself. Now here is where my struggle usually begins. First of all, I will choose the most difficult path, which in this case was to pick out my own beads from a selection that would boggle the brain. The jewelry maker told me that she has a friend that can never make up her mind on which beads she wants and I warned her that I would probably be that way as well. Since she is well practiced with situation, she told me to pick from the bracelets she had made and then we could exchange beads according to my wishes. I still struggled with just selecting a color! At this point I normally would talk myself out of it completely just because I could not make a choice so I must not want it enough to make this worthwhile. Perhaps that is just my excuse to say I am not worth it? Then I consciously made a decision instead of finding the one I think I should get to justify my reasons for wanting it in the first place, I would pick out the one that I just want, the one that catches my attention most. My eyes immediately fell again upon the one I first liked so much it at the piano studio with some beads of stemmed flowers on a black background. Then I tried to talk myself out of it: It is bulky and heavy so would I really wear it? I could not use the metal allergy since most of it is made with glass beads, probably from China so maybe I should not get it because of lead? I do not wear the black and purples to match it really. In fact, I am a pretty drab dresser with denims, whites, and earth tones except for a few hot pink T-shirts, so I was telling myself I should go for the browns or something else that I could match. However, I surprised myself and picked the one I really liked and asked her to add some green beads, matching those green flower stems. I even had her pick them and when she put it together...I just loved it! Next thing I knew, just a few hours later that day I found a cute black top for around $6 with the Kohl's price tag of $46.00 still on it at a nearby (to the piano studio) SERV store and a black sweater for around $5 at Goodwill so now I am liking black along with some other colors I have not dared to wear. I have always liked short black boots, black tops, and black belts with a light denim jeans, but I cannot think of any time I have ever had such an outfit of my own...yet. I know it is just a bracelet and the bracelet did not change my life, but it is symbolic of a change in my life...and I am allowing myself to really enjoy the bracelet and the love for myself that it symbolizes. Your pastor is right about your neighbour. I still struggle with this too & it prevents me reaching out even when I know I should. So many of us carry hidden scars. No wonder Jesus told us to be kind. I have this great desire to ease the pain of others, to see (often feel, being empathic) the hurts people try to hide, maybe that is also my way of finding a connection with people. I see in everyone a hurting child like I was and then I want to comfort and heal each one of them as I wish I had been, but sometimes I have to get past my fear of my own vulnerability to help them.